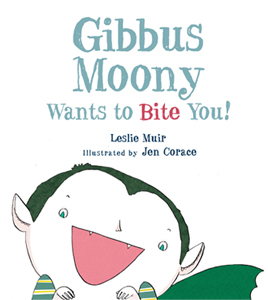 Gibbus Moony Wants To Bite You! Watch out! This little vampire is looking for a bite. Gibbus Moony’s grownup fangs have finally grown in. Now all he wants to do is chomp on something juicy! All day Gibb hunts high and low for his first unsuspecting victim. But just when he thinks he’s found the perfect bite, he may discover something even more fangtabulous to sink his teeth into. Get ready for a totally toothsome tale!